Spring weather has arrived and the need for a sprinkle of fertilizer to spark a tinge of green may be realized throughout the region. Lawn fertilizer choices abound: differing brands, synthetic or organic, and quick release nitrogen or slow. A main determining factor that should be considered before selection is the nutrient analysis. This fertilizer feature is commonly overlooked or misunderstood, but can have a profound impact on the health of your soil, and more importantly the health of our streams and waterways. While some fertilizers also supply nutrients like iron and sulfur, the main three numbers on the bag are N (nitrogen) – P (phosphorus) – K (potassium), representing the percentage of each nutrient in the bag. These three macronutrients are needed in relatively high levels by the plant. Nitrogen is most limiting in a lawn, since nitrogen is mobile in the plant, moves to young leaf tips, and is subsequently mowed off. Nitrogen is more limiting in a young lawn than an older one, since organic nitrogen sources, including mulched leaf clippings, have not built up in a new lawn soil. A soil test can't assess nitrogen needs for lawns, since the nutrient is not stable in the soil and release rates fluctuate wildly. The level of phosphorus and potassium along with the estimated plant need can be estimated by soil tests. These two nutrients are found in many soils, and as shown in figure 1, phosphorus is found in very high levels in the metro St. Louis area by the MU soil testing laboratory. In established turfgrass, phosphorus deficiencies are rarely observed for two main reasons. Turfgrass roots secrete an enzyme that degrades organic phosphorus making phosphate available. Also, the turfgrass root system and associated soil organic matter support a diverse microbial community that also produces enzymes making phosphorus available to the plant. Excess phosphorus, on the other hand, can cause many problems. From a plant health perspective, excess phosphorus will act to tie up other micronutrients, including iron, copper, and zinc, and make them unavailable to the plant. A span of 3-5 years may be necessary until this condition is naturally balanced. Excess phosphorus may also end up in our streams and waterways causing damaging eutrophication and harmful algal blooms (see https://extension2.missouri.edu/g9181). Note the exceptionally high levels of phosphorus and potassium after years of use of a complete fertilizer. Tall fescue at this site was thin and not healthy. While excess potassium doesn't cause quite as much plant harm as phosphorus, the element can also make micronutrients unavailable to the plant. Micronutrient applications in lawns should not be needed for maintenance, but with an excess of phosphorus and/or potassium they might be. Why spend the extra money? Staying out of an excessive phosphorus and potassium situation is quite simple following the below guidelines. On an established lawn, use an incomplete fertilizer with nitrogen. Taking an incomplete in a class was frowned upon, but in this case is the correct move. With X being a number, an incomplete fertilizer should have a ratio X (with N) – 0 (no P) – 0 or low number (no K or at most 1/3 of the amount of N). A complete fertilizer is an X – X – X, and in most cases should not be applied to an established lawn. Take care when applying organic-based fertilizers, as many products will contain a potentially unneeded and hazardous phosphorus component. Use the University of Missouri Lawn Fertilizer Calculator to make certain that you don't overapply fertilizer. A little more fertilizer is not better, it's a waste and a pollutant. A lawn being seeded or established may require phosphorus, and therefore a complete fertilizer. Remember there is a limited root system and associated microbes to secrete those phosphorus degrading enzymes. To determine the amount of phosphorus or potassium needed, submit a soil test to the MU soil testing laboratory. For more information, see http://soilplantlab.missouri.edu/soil/turfsoil.aspx, and additional guidelines here - https://extension2.missouri.edu/g6954. Conduct a soil test on established lawns every 3-5 years. Fertilize and conduct other necessary maintenance practices according to the Cool-Season Grass Lawn Maintenance Calendar for tall fescue or Kentucky bluegrass lawns. 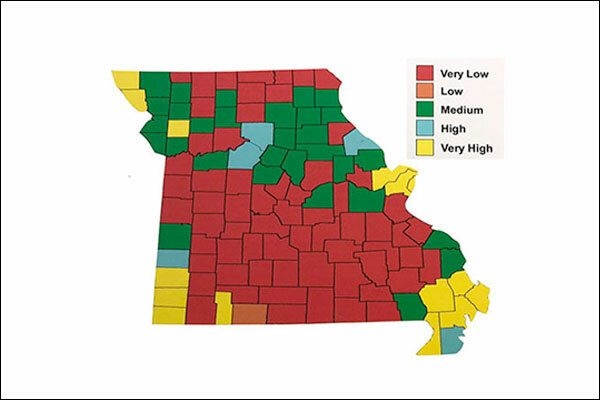 For zoysiagrass lawns, follow the warm-season turfgrass guidelines provided in https://extension2.missouri.edu/g6706. Last but not least, clean up after making a fertilizer application or whenever using a spreader. Invariably, fertilizer granules will end up on driveways, roads, or sidewalks. Use a hand-held blower and get those granules back on your lawn where they can be used in the plant system. Otherwise, rain pushes the fertilizer down the concrete conduit to storm sewers, eventually polluting our important water resources.